UPDATE: The Prince George’s County Police Detectives are investigating the death of a man found inside of his car near Indian Head Highway just before midnight Thursday. Officers responded to a 911 call for a single vehicle that had run off Route 210 and had come to rest in the 17000 block of Beech Lane in Accokeek. An autopsy later that day determined that the driver, Patrick Mann, died of a self-inflicted gunshot wound just prior to the crash. Mann was the sole occupant of the vehicle, and no other vehicles were struck. Detectives from the Prince George’s County Police Department, Criminal Investigation Division are leading the investigation, and have no further information at this time. 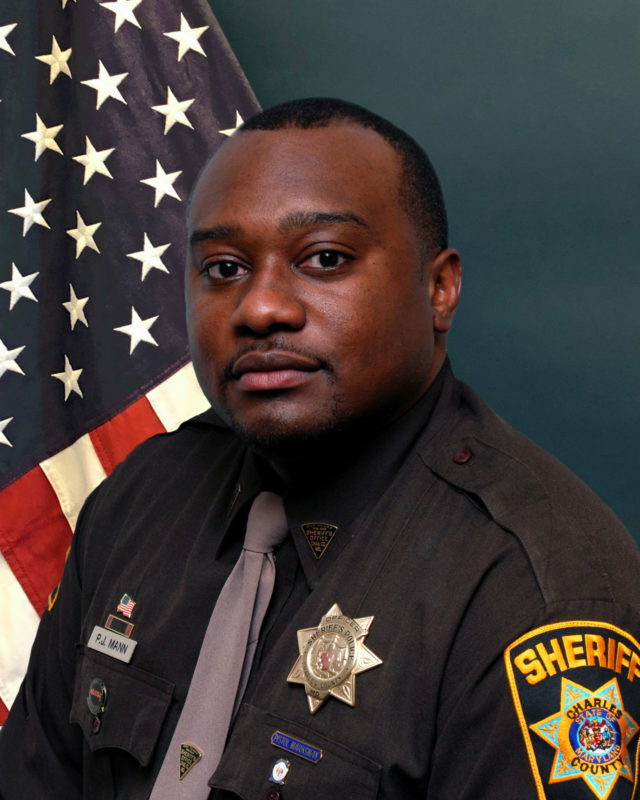 1/25/2019: Charles County Sheriff Troy D. Berry is deeply saddened to announce the untimely death of Corporal Patrick “P.J.” Mann, a school resource officer assigned to St. Charles High School in Waldorf. Cpl. Mann was found deceased inside his personal vehicle last night after it ran off the roadway in the area of Route 210 in Accokeek in Prince George’s County. His death is being investigated by the Prince George’s County Police Department. Cpl. Mann began his career with the Charles County Sheriff’s Office in 2005. He worked in patrol and then in 2008 was transferred to the School Resource Unit. He previously worked at Matthew Henson Middle School and J.C. Parks Elementary School before being assigned to St. Charles High School where he has served since it opened in 2014. In addition, he covered Mary B. Neal Elementary School. “P.J. was a great school resource officer who was dedicated to the safety and well-being of students. He was beloved by everyone who knew him. He was invested in the success of students and was a part of the Distinguished Dozen program in which he dedicated his time to mentoring a select group of students on academics, manners, life-skills and so much more. We are in the process of gathering more details, but for now I simply ask that you keep P.J., his family, his school resource family, students and staff with Charles County Public Schools, and his brothers and sisters at the Charles County Sheriff’s Office in your thoughts and prayers,” said Sheriff Berry. This entry was posted on January 25, 2019 at 10:09 pm and is filed under All News, Charles News, Community, County, Education, Law Enforcement, Top News, z 600X120 Top Ad Bottom, z Police Ad Top. You can follow any responses to this entry through the RSS 2.0 feed. I have not seen Mann since we graduated from the Police Academy years ago. But even as a young officer, he was filled with pride, dedication and honor. He always had encouraging words and was dedicated to helping if others. He was a good person who made a difference in the lives of so many young people. Rest In Peace, P.J. My condolences to his family and friends.I have two sons that attend St.Charles high school.. He will be missed dearly by all that knew him.. I knew officer Mann when I went to Matthew Henson and I always talk to officer Mann he was the only one who knows that I have been bullied in the school and he assured me not to pay attention to them. My sincere condolences to the family of Officer Mann. May you somehow find peace and comfort in knowing he is with The Lord. I am so sorry for your loss. Wow….a UMES Alumni, gone too soon! I’m at a loss for words! We will miss you! Gone too soon! Y sincere condolences to his family. Particularly to his wife, Ranisha and their son, Dylan. PRAYING FOR HIS FAMILY .. Spell and grammar check can be your friend if you use them. My condolescenses to the family! Thanks for your setvice Sir! REST IN PARADISE! Deepest condolences rest in peace brave friend. So so sorry to have lost this man. I did not know you, but as a former LE officer and SRO, I know how hard it can be. I just wish others had known and maybe could have intervened. My heart hurts for your family, Officer Mann. Rest In Peace, my brother. Another officer lost to suicide…. PTSD is not just military!! I truly wish I knew him and maybe somehow could have helped him. Im truly sorry for his family….. RIP sir…. And thank you for your service to the people and children of Charles County!! He was my neighbor I saw him everyday even the day it happened…I wish he would have said something he look so sad and was by him self all the time …but the personal life was hard but I never new he was so lost…God please forgive him for what he has done he thought this was his only way out but jesus please save his soul. Thank you for this comment! Yes! Please save his soul Jesus! Praying for the family and his soul. Rip big fela. Postal Police sends you love from the blue family. Didn’t know you personally, but spoke to you at the games. Thank you Corporal Mann for your service and protection of all . I pray that our loving Jesus now will wrap you in his arms for eternal peace. was there a note & has it been released?